Osteoporosis is a disease marked by reducing bone mass, density, and quality. This makes bones weak and brittle. If left unchecked, it can lead to broken bones . Breaks of special concern are of the hip , spine , and wrist . But, they can happen anywhere. If found early, the progress of the disease can be slowed down. This will also lower the chances of other health problems. Over a lifetime, bone is lost and added to the skeleton. During the child and teen years, new bone is added faster than old bone is removed. As a result, bones become heavier, larger, and denser. Peak bone mass (measured by bone mineral density) is reached around age 30. From that point on, more bone is lost than is replaced. This usually happens at a slow rate. When women reach menopause, their estrogen level drops. The bone loss happens faster than bone building. If not treated, excessive bone losses may lead to osteoporosis. It’s more likely if peak bone mass was not reached during the bone building years. Bone mineral density also plays a role in bone health. Calcium, phosphorus, and other minerals are contained within the structure of the bone. The amounts of these are a part of bone density. The bone weakens as these levels go down. Bones can stay strong throughout life. Getting enough calcium and vitamin D, and regular exercise helps to do this. Ten million Americans have osteoporosis. The majority are women. What are the risk factors for osteoporosis?What are the symptoms of osteoporosis?How is osteoporosis diagnosed?What are the treatments for osteoporosis?Are there screening tests for osteoporosis?How can I reduce my risk of osteoporosis?What questions should I ask my doctor?What is it like to live with osteoporosis?Where can I get more information about osteoporosis? Osteoporosis. EBSCO DynaMed Plus website. Available at: http://www.dynamed.com/topics/dmp~AN~T113815/Osteoporosis . Updated February 1, 2018. Accessed June 23, 2018. Osteoporosis overview. 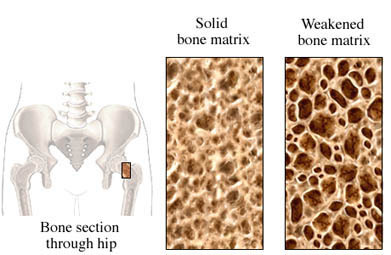 NIH Osteoporosis and Related Bone Diseases National Resource Center website. Available at: https://www.bones.nih.gov/health-info/bone/osteoporosis/overview. Updated February 2017. Accessed June 23, 2018. What women need to know. National Osteoporosis Foundation website. Available at: https://www.nof.org/preventing-fractures/general-facts/what-women-need-to-know. Accessed June 23, 2018.